Ugadi represents the start of a fresh year wherein nature is at full blossom and which represents rejuvenation and enjoying the season’s freshness. Ugadi festival comes in the months of March or April. Ugadi produces pleasure, peace and prosperity in your life. Because it is the starting of the New Year and spring season, it is also the appearance of the new harvesting such as mangoes, tamarind, jaggery and neem flowers. 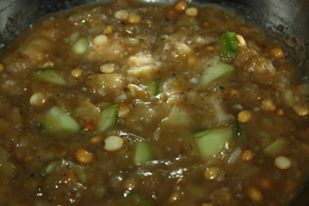 Probably the most distinctive and important traditions of Ugadi is experiencing the conventional flavored pachadi (chutney) that epitomizes the soul of Ugadi festival. Ugadi pachadi is the combination of six various tastes sweet, sour, salt, pungent, spice and bitter which as a whole referred to as six tastes or Shadhruchulu. It shows that our life is a combination of joy, unhappiness, rage, disgust, worry and surprise.